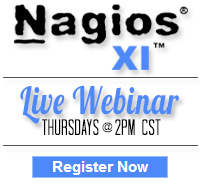 We are pleased to announce that Nagios XI 2012r2.0 is now available. As an ongoing commitment to our customers, this release includes numerous small bug fixes, improvements, and new features to extend upon the most powerful IT infrastructure monitoring solution on the market. This release includes an upgrade to Nagios Core 3.5.0, which contains bug fixes and updates related to downtime, restarts, and the way non-ASCII characters are handled. To learn more about the changes included in Nagios Core 3.5.0, you may view the changelog here. Also included in XI 2012r2.0 is an upgrade to NDOUtils 1.5.2, which includes updates to address the effects that low system resources can have on database communications. Read more about NDOUtils 1.5.2 here. A new feature included in this release is the ability to display a custom logo in your exported reports. In past versions, reports displayed the Nagios XI logo by default, but now with the use of the custom logo component, you may display a logo of your choosing. An additional feature now allows host aliases (descriptions) to be searched via quick find. Lastly, as part of this release, XI is now compatible with PHP 5.4. To view a quick guide on how to upgrade an existing Nagios XI installation to the latest release, click here. Category: Development, Nagios XI and Updates. 1 Comment Tags: Custom Logo Component, nagios, Nagios Core, Nagios Core 3.5.0, Nagios Ideas, nagios xi, Nagios XI 2012r2.0, NDOUtils, NDOUtils 1.5.2, PHP 5.4.